Lexmar USA is in the process of building a network of contractors and home remodelers nationwide. Our wholesale prices are extraordinary and we look forward to working with you to serve your customers needs. Whether you want to work with us directly, or you’d like to help us cultivate a relationship with your local distributor, we want to hear from you. If you are in the kitchen and bath remodeling business or a new construction builder, we have excellent quality products for your clients in various options and price ranges. We can help you create a custom kitchen or outfit several units with custom cut or prefabricated pieces. We also offer Quality Remnants for smaller jobs that require a simple piece of Granite, Soapstone, Quartz, or Solid Surface. In this economy, you need optimal value to get customers. 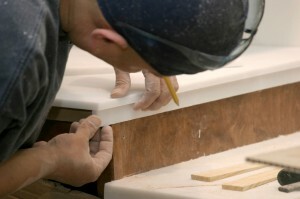 Lexmar USA’s prefabricated or custom-made countertops will ensure that you get the edge you need over the competition. Our products are comparable to any of the major brand names in Solid Surface Countertops or Engineered Stone Countertops, but Lexmar has the ability to offer prices that will easily allow you the lead over your competition. Not only do we offer wholesale Solid Surface Countertops in a wide variety of colors, we can also cut them to any shape to meet the needs of your customers or a particular project. This allows you to secure more jobs, giving you the ability to incorporate innovation and design flexibility, adding to your portfolio and securing future business through referrals! If your client prefers natural stone products, we also carry a wide range of Engineered Stone and Engineered Quartz Countertops, which combine the benefits of the natural world with man-made ingenuity to create the hardest countertops in the industry. Also available cut to spec, our Engineered Stone Countertopsare priced competitively so you can successfully grow your business regardless of the economy. Just let us know what you’re looking for and we’ll work to provide it for you quickly and at a great price. We are proud to have worked with hotels across the U.S., and enjoy large-scale installation projects. Lexmar USA is still a small company, which means we keep our costs low and offer great prices. We also work closely with all of our contractors to develop long term relationships, which is a reflection of our commitment to providing superior customer service. Our experienced and professional staff is top-notch and we look forward to developing long-term relationships with our contractors. Lexmar USA has an alternative Solid Surface Countertopto offer you. Click here to learn more about Lexmar’s Solid Surface Solutions. Lexmar has products that are comparable in quality and at a competitive value. Regardless of what you’re looking for, Lexmar has a great wholesale countertop or bathroom fixture to meet your customer’s needs. For more information about our products and/or services, contact us today! We look forward to doing business with you!